Durham, NC - Carlos Hernandez and two Bulls relievers combined to allow only one hit, while Chris Richard and Ryan Shealy each blasted two-run homers as the Bulls opened up a six-game home stand with a 7-0 shutout of Buffalo. Durham improved to 11 games over .500 for the first time this season at 35-24. 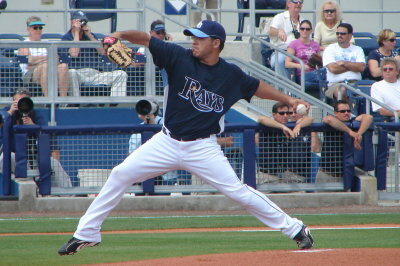 Hernandez fanned a season high eight batters with a good mix of pitches, and induced six more outs on ground balls. Hernandez improves to 5-3 on the season, lowering his ERA to 2.90. The only hit of the night for Buffalo came in the first inning on a two-out single by Mike Jacobs. The Bulls offense started the onslaught in the fourth inning, as Shealy blasted a 1-1 offering by Dillon Gee onto the patio of Tobacco Road Sports Café in left field to give the Bulls a 2-0 advantage. The homer gives Shealy 22 extra-base hits out of 36 total hits on the season. Alvin Colina followed with a single and JJ Furmaniak doubled to keep the rally going, putting men at 2nd and 3rd for the top of the order. Elliot Johnson and Desmond Jennings followed with infield singles which brought home two more and made the score 4-0. Jennings has eased into the two-spot in the lineup for the Bulls, putting together his second consecutive three hit performance on the night. Over the last two games, Jennings has raised his average 30 points and now sits at .258 for the season. The Bulls added two more in the fifth, as Chris Richard continued his hot hitting with a towering two-run bomb over the wall in right for his 10th home run of the season. Richard extended his hitting streak to 10 games and is 20-for-43 (.465) during that stretch. The bullpen took care of the rest for Durham, as right-hander Joe Bateman worked 2.0 scoreless innings in place of Hernandez, walking one. Dale Thayer came on to work the ninth, striking out two of the three batters he faced to keep the one-hitter in tact. In addition to their victory Tuesday night, the Bulls also received good news when they learned Jeremy Hellickson was named the Rays’ Organization Pitcher of the Month for May. The young right-hander has been one of the most dominant pitchers in the IL this season, and finished out May going 4-2 with a 2.43 ERA in six starts. Hellickson will be on the mound tomorrow night as the Bulls and Bisons continue their series at Durham Bulls Athletic Park. The Bulls righty looks to earn his ninth win of the season, which would tie him for the most victories in all of minor league baseball. He will be matched up against RHP Tobi Stoner (3-5 4.91) for Buffalo. Game time is set for 7:05 p.m.